When your house gets sprayed by a skunk, it is easy to identify the affected clothes in your closet. The odor is so strong that you will be able to know which clothing has the smell. You need to act fast since the scent spreads quickly. Don’t leave soiled clothes in your laundry basket or the floor. Wash the clothes and don’t mix bleach with the washing solution since it can lead to a pungent smell. The washing solution can be in the form of household ammonia, baking soda and hydrogen peroxide, or distilled white vinegar. Using the same cleaning solution, wash carpets and upholstery that have been affected. If not cleaned, the smell can spread to the furniture and other parts of your home. Determine the sprayed regions by smelling different parts of the furniture and carpet. With carpets, focus on areas where pets hang out. Also, wash your pet if it was sprayed. After eradicating the skunk smell from clothes, pets, furniture, and carpets, keep all the doors and windows open for as long as possible. But if it’s winter season, keep them open for short periods of time so that you don’t freeze. Make sure to turn on the base and ceiling fans in addition to opening doors and windows. Also, turn on the bathroom vent fans for skunk smell removal. Vinegar has a strong smell at first, but it quickly dissipates. 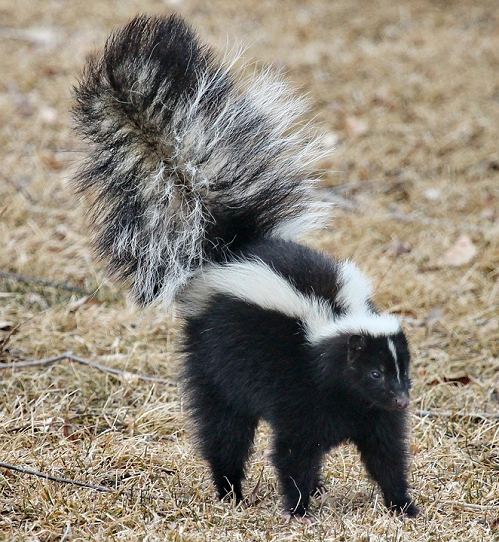 The vinegar particles in the air absorb the skunk odor. The particles are then circulated outside, and fresh air comes in when windows and doors remain open. Consistently spraying an environmentally friendly deodorizer is another step of how to get rid of skunk smell. A majority of air deodorizers will destroy the odor as opposed to masking it. Air deodorizers will be a great addition to the other means of eradicating the smell. Skunks can be a real menace to your home. There are times when the problem persists and contacting animal control for skunk removal can help handle the issue permanently. Previous PostOpossums Have a Bad Rap: Give them a Break!Next PostDid You Know Opossoms Aren’t Really Dangerous?